3.5 out of 5 based on 29 bloggers and 1 commenters. To edit the slider you need to changes the images and urls directly in your template code. To edit the social icons links you need to search and changes the urls directly in your template code. 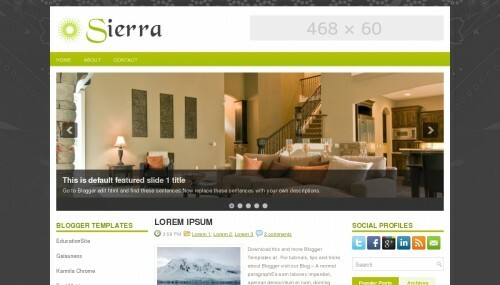 Sierra is a free blogger template adapted from WordPress with 3 columns, left and right sidebars, ads ready, footer columns, slider, social bookmarking icons, posts thumbnails, tabs and vectorial elements. Excellent template for blogs about home and decoration.